It is done. . .
Just finished the Easter Vigil here at St. Dominic's. . .we received 13 new Catholics into the Church! "It is finished. . ." and begun. Yes, confessions can be heard on Good Friday. . .
Will your pastor open the confessional on Good Friday? Though celebrating the sacrament is not required, many pastors believe that confession is forbidden on Good Friday. Due to a bad English translation from the Latin and a desire to dampen any enthusiasm for "pre-Vatican Two" devotional practices, a generation or two of priests have been led to believe that the rubrics for Good Friday forbid confessions being heard today. The 2002 edition of the Roman Missal removes all ambiguity: "On this and the following day, the Church, from a most ancient tradition, does not at all celebrate the sacraments, except for (the sacraments of) Penance and Anointing of the Sick." So, there may be many perfectly good reasons for not offering the sacrament today; however, "The rubrics say we can't have confession on Good Friday" is not one of them. BXVI: "Is disobedience a path of renewal for the Church?" Recently a group of priests from a European country [Austria] issued a summons to disobedience, and at the same time gave concrete examples of the forms this disobedience might take, even to the point of disregarding definitive decisions of the Church’s Magisterium, such as the question of women’s ordination, for which Blessed Pope John Paul II stated irrevocably that the Church has received no authority from the Lord. Is disobedience a path of renewal for the Church? We would like to believe that the authors of this summons are motivated by concern for the Church, that they are convinced that the slow pace of institutions has to be overcome by drastic measures, in order to open up new paths and to bring the Church up to date. But is disobedience really a way to do this? Do we sense here anything of that configuration to Christ which is the precondition for all true renewal, or do we merely sense a desperate push to do something to change the Church in accordance with one’s own preferences and ideas? Meditations on Christian Dogma, two excellent books. . .
Two books recommendations for you. . . Both volumes were written by The Rt. Rev. James Bellford, D.D. and first published in England in 1898. The links above will you give the 3rd editions of these volumes published in 1906 and reprinted by St Pius X Press. Bishop Bellford gives us two excellent volumes of meditations on basic Christian dogma. Volume One covers God, The Incarnation, and The Blessed Virgin. Volume Two covers Beatitude, Laws, Grace, Virtue, Human Acts, and The Last Things, among others. Three qualities highly recommend these books: orthodoxy, clarity, and brevity. First, orthodoxy: these meditations provide thoroughly orthodox insights and explanations of the principle dogmatic truths of the Catholic faith. Written before modernist and postmodernist innovations infected our theological vocabulary and thought, these volumes lay out the fundamentals of our apostolic traditions as the Church has received them from the beginning. The Good Bishop was deeply influenced by Aquinas and his books can be read as commentary on the Summa. Though there is no critical apparatus to link specific meditations to individual articles of the saint's major work, a quick glance at the table of contents will confirm that Bellford has structured his work along a line similar to Aquinas'. Second, clarity: without the gobbledegook of modernist and postmodernist theological language to clutter up his thoughts, Bellford's meditations are strikingly clear. He relies principally on scripture, conciliar documents, papal decrees, and the Church Father for his images, vocabulary, and tone. For example, he introduces his meditation on The Last Supper, "In the Last Supper Jesus Christ exhibits His love, and proves Himself to be our best Friend. . ." He then quotes John 13.1 and continues, "This was the farewell banquet on the last evening of His earthly life; in it He delivered His Testament, His final work of love, and bequeathed as a keepsake and eternal memorial of Himself. This bequest was not His portrait, not even the most valuable of His created works, not an empty type or figure of Himself; it was Himself under the form of a simple creature, it was His own Body and Blood, it was the food of eternal life for our souls under the appearance of perishable bodily nourishment. . ." Simple, clear, concise. Some of the more philosophically complex topics naturally use more sophisticated language, but the overall style of his writing is easily comprehended but nonetheless rich for reflection. Third, brevity: each meditation is exactly two pages long. This means that he gets to the meat of the matter w/o sputtering on about his feelings or personal experiences. If you want a book of meditations that touches your emotions, then you will have to look elsewhere. Bellford's books are meant--in their brevity and clarity--to shoot you with the large dose of intelligent insight quickly and cleanly. I highly recommend these books for Catholics who suffered through the Dark Days of butterflies and rainbows catechesis and who now find themselves grasping for an anchor in the faith. For new Catholics, these books will give you more than just the basics; they will give a foundation and a solid framework from which to grow in holiness. For seminarians and clergy, these books will give you a basis from which to access newer theologies and often provide excellent prompts for papers and homilies. NB. Fr. Michael has the Holy Thursday Mass tonight, so no homily from me. 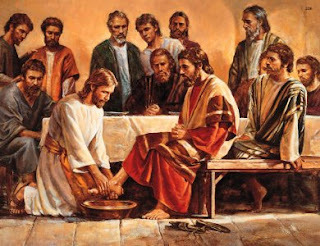 I thought I'd repost on the Annual Holy Week Liturgical Question of Foot Washing. . . The B.I.G. issue, of course, is whether or not women can be included as washee's. The rubrics clearly require that the washee's be men, males (viri). In the U.S., bishops are allowed to grant pastors an exception to include women. Most do, I would bet. Fine. 2012 Addendum: One of the stated goals of the Spirit of Vatican Two Revolution is to de-clericalize the Church by opening all liturgical roles to the laity. Following the rubrics for the Foot Washing gets in the way of this hallowed goal; therefore, the rubrics must be ignored. Listen carefully to the homilies tonight. How many preachers note that Holy Thursday is specifically designed to celebrate the institution of the Eucharist and the ordained priesthood? If your pastor doesn't mention this element of the liturgy, it is probably b/c he's never heard it himself! Judas faithfully served his god. . .
We become what we worship; that is, we change into that which we love most. Ps 115 teaches us that the makers of idols and those who trust in them will be just like their own creations—with eyes that do not see, noses that do not smell, ears that do not hear, and throats that do not speak. If you love a thing of this passing world, your love will be passing as well. If you love God—eternal and boundless—your love will be eternal and boundless; you will become a partaker of the divine love that makes and sustains all of creation. Judas is an example of a man who loved passing things instead of God; he loved money, power, influence, and his own skin—all of which betrayed him when he died. Judas' betrayal of Christ is the most egregiously treacherous act in human history. But do we understand why he did it? Do we understand the nature of his betrayal? We must understand if we are to see this temptation heading our way. Judas' treason was rooted in his worship of the things of this world. He was an idolater. He became the thing he worshiped. And died in its service. I don't mean to suggest here that Judas was transformed into a lump of silver. Money is simply a way to evaluate the relative value of things in order to make commercial exchanges more convenient. We use phrases like “he sold his soul for a drink” as a way of saying “he committed murder in order to get the money to feed his addiction.” Now, think in more spiritual terms. Judas sold Christ to the temple for 30 silver coins. To be more precise, he sold the temple information on Christ's whereabouts. But in doing so, he sold his soul for that bag of coins. Why did he do it? Judas served a lesser god while pretending to serve our Lord. He worshiped at the Altar of Temporary Things. We could call it avarice or lust for power but it amounts to the same thing: he did not love the Lord; instead, he loved his possessions and he wanted more. To satisfy his god, he sacrificed his friend and teacher. And, in the end, his god made good on its promise—Judas himself became merely a means for exchanging one thing for another. His coins bought him a hanging suicide and a name forever linked to the betrayal of one's friends. For all his infamy in our history, Judas was just a man, an ordinary man tempted to the limits of his willingness to love. My prayers books. . .
Just wanted to plug my prayer books! The first two books contain original litanies, novenas, and prayers written in a traditional format but addressing more contemporary issues and needs. The second book contains an original rosary based on the Sermon on the Mount. The third is booklet-sized version of the Beatitude Rosary that appears in the second book. This booklet is also available in Spanish. Almost forgot the Monday Fat Report! 327lbs. Nothing lost, nothing gained. Gotta lose a little before Good Friday. . .those prostrations before the Cross ain't gonna do themselves. End of an era. . .
Keep Scuba Mom in your prayers! Today is the first day of her retirement. She's worked at the same bank for 30 yrs. Also, keep Pop in your prayers as well. . .he's responsible for entertaining her. Good luck with that, Pop! A Vespers homily from fra. Thomas More Barba, OP, student friar of the Southern Dominican Province. . .
fra. Thomas is preaching in the chapel of the new studium priory in St. Louis. On an Army base in Afghanistan: a cross is offensive. . .but a rainbow flag is just fine. Plane makes emergency landing b/c two kids refuse to buckle seat belts. . .apparently, their parents were with them! Give them a few years and they'll "Occupying" something with all the other brats. ". . .the nearly impenetrable parochialism of American liberals." They are shocked that someone, anyone could disagree with them. Make that "American liberal Catholics" and this article describes the contemporary Church perfectly. Heh. The MSM is shrieking about the ideological prejudices of the five conservative Justices who ripped into ObamaCare this week. No mention of the ideological prejudices of the liberal Justices who had to make B.O. 's argument for him from the bench. Devious, dishonest, creepy. . .she forgot amateurish. NBC caught red-handed editing the 911 call from Zimmerman. Read the transcript of the actual call and you will understand why our media are the least trusted of America's professionals. Catholic biblical interpretation. . .excellent article for Easter studies! The U.N. is the enemy of life. . .abolish it. Conservatives understand liberals. . .liberals do not (cannot?) understand conservatives. 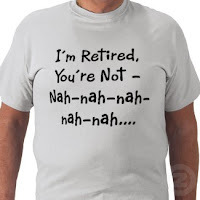 The consequences of self-righteousness? Choose wisely who you will be this week. . . The King has arrived in Jerusalem! We shouted his name. We sang “Hosanna, hosanna in the highest!” We waved our palm branches, welcoming him among us. Then, we read aloud his Jerusalem Story. He's anointed in the house of a leper. He's sold as a fugitive to his enemies by Judas. He celebrates the Passover feast with his friends. He gives us the bread of life and the chalice of salvation, his Body and Blood. He is abandoned by his friends in the Garden of Gethsemane. Denied three times by Peter and betrayed by Judas. He is tried by Pilate, convicted by the crowd, scourged by legionaries, herded to the Place of the Skull, and nailed to a cross. To die for us in our sins. The question of Holy Week, the challenge set for us is this: how far do you follow him? Are you the woman from Bethany? Peter? Judas? Pilate? Are you in the faceless crowd? A Roman solider? Or, are you Mary, his mother at the foot of the Cross? John, his beloved disciple? Are you the Good Thief? Who you choose to be this week determines who you will become Easter morning. Choose wisely, choose Wisdom!